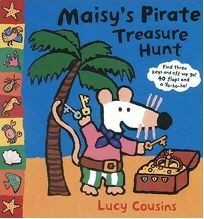 With brandished cutlasses and bandannas aplenty, the gang seeks doubloons in the oversize board book Maisy's Pirate Treasure Hunt by Lucy Cousins. Myriad flaps on each page invite readers to look for three keys to open a treasure chest. The backs of the flaps feature illustrations that match with the larger picture when folded back a toucan flies out from a palm tree's branches, and a centipede crawls out of a cave. (July) .